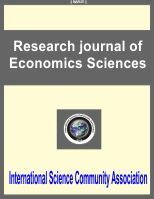 International Science Community Association are publishing an international peer reviewed journal Research Journal of Economics Sciences . It is the vision of International Science Community Association to publish research papers, research articles, review papers, mini review, case study and short commutations in all areas of human study without financial restriction. Coverage Area:: Researches in the field of Economics sciences which including Scope and Method of economics, Economy studies, theory and practice, History of Economic, Economic systems, Economic development, green economics, Economic models, Political economy, Microeconomics and Macroeconomics, New Approach of Macroeconomics, Business economics, national income, economic growth, Public Economics, International Economics, International Trade, Economic Prediction and Decision-Making, Applied economics, Econometrics, etc.